Welcome to the IslandWood Garden! : Welcome back SOP! It's hard to believe that the first month of school, and of our School Overnight Program is complete! It's been a busy month at IslandWood and we are thrilled to have so many children in our garden. Here is a quick look at some of the fun we've been having. Team Lightning helped us put together some potting soil and were both surprised and delighted that we asked them to "get dirty". One member of the team said, "This is sooo weird. I'm being asked to get messy and dirty by an ADULT!!" Our motto here is that it is always fun to play in the dirt. 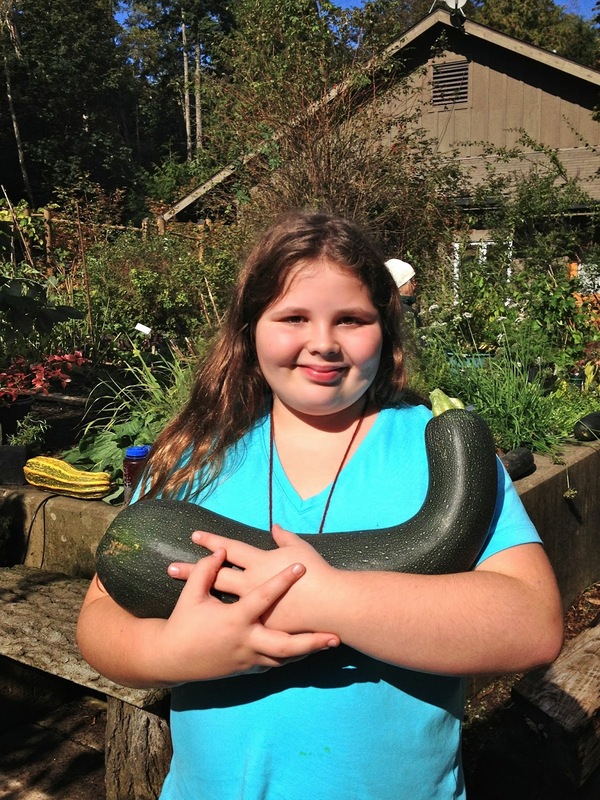 Mikaylah from Team Rain with her "baby zucchini"
Many of our zucchinis outgrew themselves during the month of August, and they are now on display for the kids to see. We have lined them up along the garden wall and they make quite an impression when the kids enter the garden. Team Rain thought they looked like zucchini "babies" and promptly adopted one to carry around while at IslandWood. Tea is always a nice afternoon treat and Team Wave made a beautiful pink tea using beets! They steeped rosemary, mint, apples and beets and enjoyed their warm garden drink in the greenhouse. 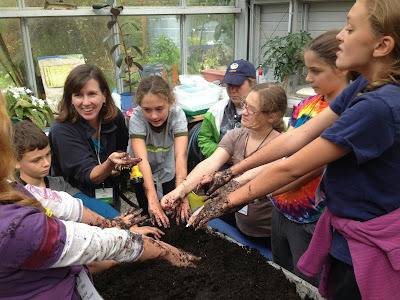 We are just getting started with the school year but look forward to a year full of garden projects and lots of good tasting, playing and learning together!